Box Dimensions (LxWxH) 2.1 x 1.5 x 1.4"
Professional Portra 400 Color Negative Film (35mm Roll Film, 36 Exposures) is rated 4.8 out of 5 by 306. Rated 5 out of 5 by Joseph from Consistent!! Best for the money, best for the color, best in class!! Portra is seeing its best days. The color accuracy is incredible. In the digital age with seemly unlimited digital storage, I wish it came in 72 frame rolls. Guess I could roll my own. Portra is an excellent front runner in the 35mm film world and I will continue to use it regularly. I now use my digital SLR as a sidekick to my 35mm film camera because I am so please with the results and the am in love again with the photographic process. Waiting to see the image and not letting the LCD on the back of my camera get in the way of making my work. Keep on producing Kodak, we're still here! Rated 5 out of 5 by Brian Entz from The best color negative film you'll find Outa sight! You can push this to kindgom come. Shoot it at 800 or 1600 without even pushing. Keep this in your camera and be ready for anything. Rated 4 out of 5 by Ronnie_retro from Very good 400 color neg Long story short: Shot at EI 400, it's at least as fine grained as Fuji 200;shot at EI 200 it is definitely finer grained. But underexposed by a stop it shifts blue, underexposed by two stops it's blue, quite grainy and loses shadow detail. Handles 2-3 stops overexposure well. Rated 5 out of 5 by Anonymous from Love this Film! such a diverse film I use it in both low and normal lighting situations. The film grain is very fine you wouldn't guess it was 400 at first glance, and it has a great latitude. Amazing color palate for portraits natural and mixed lighting. Rated 5 out of 5 by Anonymous from Favorite Consistent All-Around Film It's worth to me to pay a little more for Portra 400 because it is such a great film. It scans well, has great latitude, and is great for portraits and general use. I know that with its longer range I am capturing as much information as possible, more than digital, and I can control most other characteristics in editing process just like a raw file. It's simply the best. Rated 5 out of 5 by Don Doblados from Awesome Film For Skin! Awesome skin tones especially when it's over exposed by a stop or more. Blacks are heavy and colors are extremely pleasing. Rated 5 out of 5 by Hal from Best film for unknown situations I've taken this film through many different situations; from street photograpghy to portaits, Portra 400 delivers! I love the smooth and creamy aesthetic. Rated 5 out of 5 by Andy from Still the best! As a working professional, I have recently switched back to shooting film for some clients, and the results I am getting with this film are getting better all the time. When this film is properly exposed ( actually, I overexposure by 1 stop for the best results) and scanned properly, the results are SUPERB; far exceeding the quality I was getting from my top-tier digital equipment. Film is still better looking with less post-processing and less expensive equipment. If your clients are willing to wait a few days for processing, I couldn't recommend this film more. Fine grain. Punchy, perfect color saturation. And best for me, it handles mixed lighting with aplomb, allowing me to focus on the shot and not worry about environmental factors as much. I'm looking for film for an old Brownie Hawkeye. Will this work? Does this come in a box of 5 or 5 individually packaged rolls? If box if five, what is the dimension of the box and the weight? Thanks! This comes with 5 rolls of film. It may be in a box or individually packaged. Since our inventory changes hourly, we cannot say exactly how you will receive the film. Please know that the expiration date is at the very least 6 months from now. Can we ferry it through the x-ray machine in the airport? Is any x-ray pack required? Do not use x ray safety packs, or leave film in checked baggage or in your camera. All of these actions will cause security to be suspicious and raise the power in the x-ray machine to the point that it will fog and thus destroy your unprocessed film. (Processed film is unaffected.) If you have a small amount of film, have it in clear zip lock bags, in the manufacturer's containers and then ask for a hand inspection so that you avoid x-ray all together. If you have a large amount of film, it is strongly recommended that you call security ahead of time so that the process may proceed smoothly. FYI, unprocessed film can go through USA TSA hand carry machines unaffected 1-4 times. 5 or more times or higher ISO may fog. If your goal is to take pictures that start out using film, then scan them into digital format that can be edited using software to produce digital pictures, what type film is best to use --- Color Negative film or Color Slide film? It depends on what kind of image you're trying to get. Color slide film has a much higher dynamic range than either a digital camera or color negative film. If you need deeper colors, or to shoot a scene that has very dark shadows and very bright highlights, and you're willing to put in the work necessary to get good exposures from a more difficult system to use, go with the slide film. 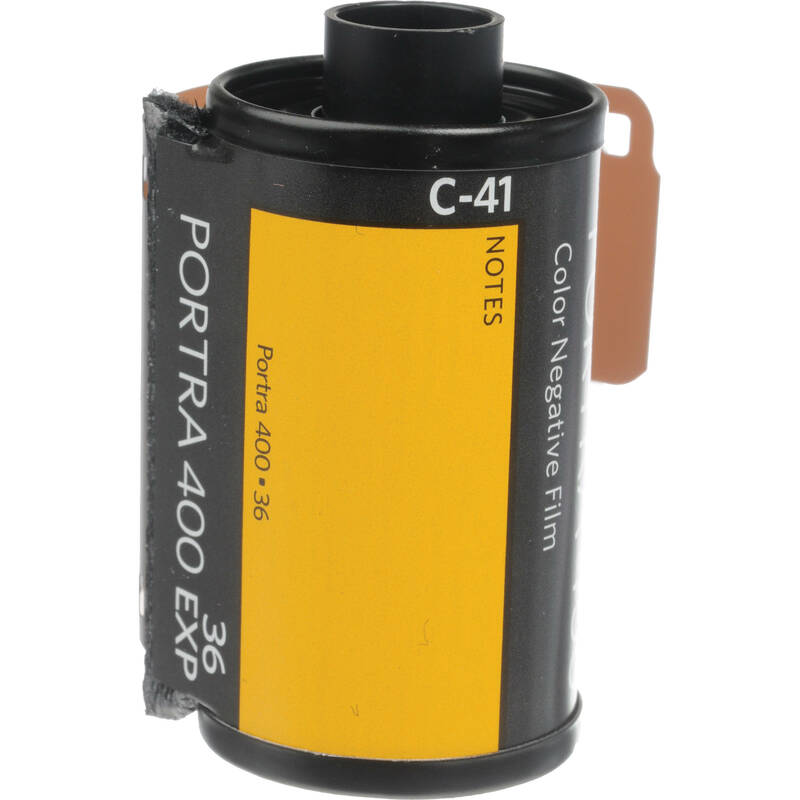 If you don't have such exacting needs, or your taste in images doesn't lend itself to the amount of saturation possible with slide film, color negatives are definitely a better option. You should also keep in mind that slide film is more expensive, that it's more expensive to process, and that it requires a better negative scanner with a very high Dmax to get a good scan. Yes, your camera will use this 35mm film, and Portra 400 has a great look so think you will enjoy it. can this be used on the konica autoreflex TC? yes. keep in mind there is no DX detector on the TC, you have to set the ISO in the camera yourself. Hi,Does this roll come in a box ? Thanks! Mine purchased from BH did NOT come in any kind of box. Just the film in the plastic can .